What is Mobile Bay Bride? Mobile Bay Bride is the premier bridal publication for Mobile and Baldwin counties. It is an annual publication produced by PMT Publishing, which also puts out Mobile Bay Magazine. When is Mobile Bay Bride published? Mobile Bay Bride is published every April and features weddings from the previous year. Who can be in Mobile Bay Bride? Any bride or groom who is a current resident or is from Mobile or Baldwin County. If my wedding is out of town, can it still be featured in Mobile Bay Bride? Yes, as long as the bride or groom grew up or currently reside here. How much does it cost to place an announcement in Mobile Bay Bride? A one-page announcement costs $450 if paid before October 31, 2018 and $500 if paid by January 31, 2019. A two-page announcement costs $810 if paid before October 31, 2018 and $900 if paid by January 31, 2019. My wedding is after January 31. Does that mean I’ll have to wait until next year to submit my announcement? Yes. The 2019 issue will feature weddings from February 1, 2018 to January 31, 2019. Unfortunately, because of our print schedule, January 31 is the latest we can receive announcements. Click here for a list of announcement materials and an overview of what your announcement includes. Can a staff member do my write-up for me? No. Since announcements are paid for, brides write their own copy. She is responsible for making sure the names of the bridal party members are spelled correctly, and all vendors are properly credited. Can I submit an image for the cover? Yes. 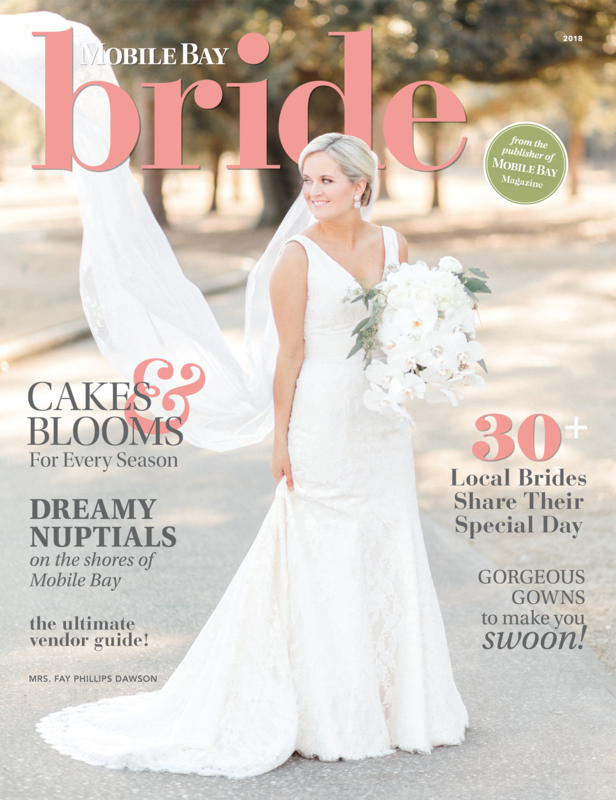 Every cover of Mobile Bay Bride features a bride whose wedding is featured in the magazine. You can send up to 10 vertical images for cover consideration. Images must be high resolution (300 DPI at 8 by 10 inches or larger). Images cannot have the photographer’s watermark or logo on them. Tip: Choose images that have simple backgrounds that will allow for text to show up on the top, right and left sides of the photo. DPI means dots per inch. A photo must be 300 DPI at 5 by 7 inches, to be high resolution, so that they print sharp, and not blurry. To run in the magazine, all photos must be high resolution. Just tell your photographer, and they’ll know what to do. Click here to submit your write-up and photos by January 31, 2019. Can I send in my payment first and then my materials later? Yes, especially if you sign up by the early registration deadline. But, all payments must be made in full by October 31, 2018 for the early registration discount. Also, all payments must be made in full by January 31, 2019 to go in the upcoming issue. All materials must be turned in by January 31, 2019. My wedding is mid-to-late January. Is there any way I can get an extension on turning in my materials? Occasionally we do make exceptions for weddings that occur close to the deadline. We typically ask that you go ahead and turn in your write-up, so we are only waiting on your photos. Contact the Mobile Bay Bride staff for more information. Will I get to see a proof of the announcement before it comes out? Yes. Look for a proof of your announcement in your email around the first or second week of February. You will have a day or two to look over it and will need to get back to us immediately with minimal changes, such as spelling mistakes and factual corrections. Since we are on a strict deadline, there is not enough time to change photos at this point. Therefore, it is very important that you specify which photos you want in the announcement when you submit them. Do you ever include feature stories on local weddings in the magazine? No. Registering for an announcement is the only way to have your wedding featured in Mobile Bay Bride. Will I get a copy of the magazine? Yes. Brides receive two free copies of the issue when it comes out. You can pick them up from our office located at 3729 Cottage Hill Road, or if you live outside of Mobile or Baldwin county, they will be mailed to you. How can other people get a copy? Mobile Bay Bride can be purchased at our office located at 3729 Cottage Hill Road or online here. It is also available at various bookstores throughout Mobile and Baldwin counties. The annual publication is also sent to in-state Mobile Bay Magazine subscribers.